Above: Outline map of Inner London. The black lines show the original 28 Metropolitan Boroughs formed in 1900. The two green boroughs were combined in 1965 to form the London Borough of Wandsworth. Until 1900 the name ‘London’ meant only one thing – the City of London. It is shown on the above outline map in pink and still exists today. Around the City were three Counties – Middlesex was on the north side of the Thames. The County of Surrey and the County of Kent formed the south bank of the Thames. The area outlined on the above map consisted of many villages and parishes which were becoming larger and larger as time went by. Most of the land was gradually being covered by roads and houses. In 1899 a new ‘County’ was formed by taking parts of Middlesex, Surrey and Kent and forming Metropolitan London, administered by the London County Council (LCC). There were 28 Metropolitan Boroughs and, in addition, the City of London remained a separate administration. That newly formed land is shown by all the black boundaries on the map at the top. In 1965 it was decided to combine the 28 Metropolitan Boroughs into 12 larger London Boroughs. Another 20 London Boroughs were created around the outside of Metropolitan area and the larger area was called Greater London. The area shown above is now called Inner London. 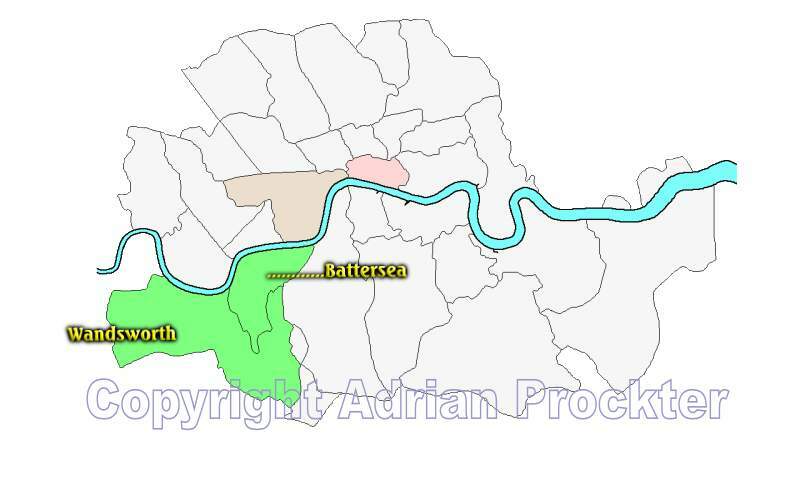 The Metropolitan Borough of Battersea and the Metropolitan Borough of Wandsworth were combined to form the green area on the above map. The new name chosen for it was the London Borough of Wandsworth – Wandsworth having been the larger of the two original metropolitan administrations. Today we start a new series. Within the six-year course on the history of London, the three terms of the academic year are devoted to different aspects of London. During the Autumn term we look at a part of the City of London. In the Spring term we consider part of the City of Westminster. The summer term is spent looking at the other 11 London Boroughs. For the next few weeks we shall be taking a look at the places of interest within the London Borough of Wandsworth which is the most westerly of the Inner London boroughs on the south side of the Thames. As can be seen, this London Borough also has a long riverfront with the Thames. This entry was posted in /Wan-Battersea, /Wan-Wandsworth, 4-Comment. Bookmark the permalink.